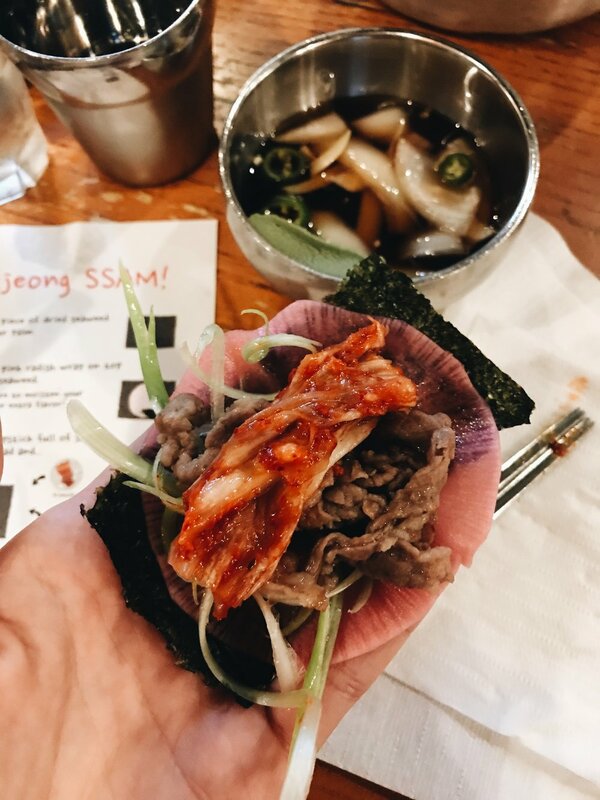 While this restaurant doesn't take reservations, and usually requires an hour and half wait, the Korean BBQ bliss you'll encounter once inside is worth the wait. For three people, we ordered Japchae (stir fried cellophane noodles), a seafood pancake, and three types of beef. With rave music on in the background urging us to eat on beat, we plowed through everything fired up on our table. Just thinking about the flavors has me drooling. While you're waiting for your Korean BBQ, sip on fresh boba and milk tea from a reusable glass jar at Snow Monster. Known for their cotton candy topped creations and instagrammable presentation, it's the perfect sweet appetizer to indulge in while you wait. Housed in a greenhouse at the Line Hotel, the Commissary serves up dishes as fresh as their atmosphere. We highly recommend their Rainbowls (the broccolini and K-town fried chicken combo was dynamite). The flavors are so well rounded and unique, you'll pause to savor each bite. A classic Korean dessert, Taiyaki soft serve is served in a fish shaped cone that is as delicious as it is cute. For the traditional experience, choose red bean as your filling and then pick from matcha, milk, black sesame, or ube ice cream. The best part about getting this treat in Koreatown? The cones are super fresh. Within walking distance from the Line Hotel, start your day with a pastry (or two or three) from 85 degrees. Upon entering, grab a tray, and serve yourself your desired breads and cakes with a clean set of tongs. Then head to the register to check out as well as order any drinks. We recommend the Taiwanese Boroh and the Egg Tart. While neither of these look very impressive from a pastry perspective, they were by far our favorites, especially if you can catch them coming straight from the oven. The LINE LA projects cool with it's serape patterned chairs, concrete finishes, and Surface magazines in each room, while also setting you up for foodie exploration through it's location in the heart of Koreatown. Located off the lobby in the LINE LA, Poketo brings a mix of modern 90s-esque style clothes and accessories and skincare products and sheet masks to truly finish off your Koreatown experience. Their motto? "Art and design for your everyday."